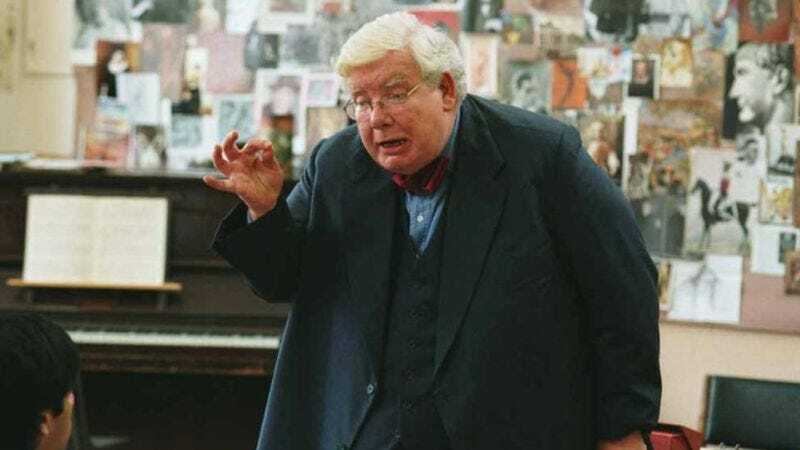 Richard Griffiths has died at age 65, of complications following heart surgery. The prolific and much-loved British actor had probably the greatest triumph of his career by starring in the 2004 play The History Boys and its 2006 movie version, but it’s safe to say a generation will likely best remember him as Harry Potter’s uncle. Griffiths worked with the Royal Shakespeare Company in the 1970s, making a name for himself in such Shakespearean comedies as The Merry Wives Of Windsor, in which he played Falstaff, and The Comedy Of Errors, in a production that was filmed for television in 1978. He made his movie debut in It Shouldn’t Happen To A Vet (1975), and subsequently had small roles in Superman II (1981), Ragtime (1981), The French Lieutenant’s Woman (1981), Chariots Of Fire (1981), Gandhi (1982), Brittania Hospital (1982), Gorky Park (1983), and Greystoke: The Legend Of Tarzan, Lord Of The Apes (1984). He also starred in the British techno-conspiracy miniseries Bird Of Prey (1982) and its 1984 sequel. Once Hollywood had a clear take on what Griffiths could do, it was quick to use him to liven up the corners of such comedies as Naked Gun 2 1/2: The Smell Of Fear (1991), King Ralph (1991), Blame It On The Bellboy (1992), and Guarding Tess (1994). For five seasons, starting in 1994, he starred as the devoted head chef and part-time policeman Henry Crabbe in the BBC series Pie In The Sky. In 2001, his pension plan arrived in the form of Uncle Vernon, Muggle extraordinaire, in the film version of Harry Potter And The Philosopher’s Stone. Griffiths perfectly filled out Uncle Vernon as the bossy and clueless guardian who has no idea just how special the child he’s failing to appreciate really is. He went on to play the character in five of the Potter movies. In The History Boys, Griffiths played a very different sort of parental surrogate: the eccentric but brilliant teacher Hector, whose genuine concern for his students and pride in their accomplishments never stopped him from giving them a good whack upside the head when they had it coming. He collected four major awards for starring in the London and Broadway productions, including the Laurence Olivier Award, the Drama Desk Award, the Outer Critics Circle Award, and the Tony Award. Griffiths also helped set off a spirited conversation in theatrical circles about proper stage etiquette when, on at least three different occasions, he stopped mid-performance to scold audience members whose cell phones had gone off. Post-Uncle Vernon, a still very much in-demand Griffiths appeared in the 2004 movie Stage Beauty, the 2005 TV adaptation of Dickens’ Bleak House, the Adam Sandler movie Bedtime Stories (2008), and Martin Scorsese’s Hugo (2011). He played Santa Claus in the 2008 A Muppet Christmas and George II in Pirates Of The Caribbean: On Stranger Tides (2011). In the premiere episode of the Showtime comedy Episodes, he even parodied himself, playing a distinguished actor who had starred in a British TV series—one very similar in spirit to The History Boys—who is replaced in the dumbed-down American version by Matt LeBlanc. Griffiths was last seen as the Duke of Burgundy in an all-star TV production of Henry V.